A Barracks OL, as seen in Grand Theft Auto: Vice City. 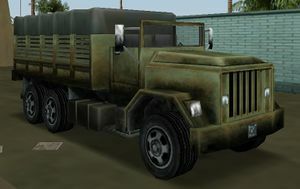 The truck is absent in Grand Theft Auto IV as the military does not feature in the game as a law enforcement entity. Appearing in traffic only when the player achieves a six-star wanted level, the Barracks OL is a military truck based on the M939 "5 ton" truck. When first introduced in GTA III, it was visually very similar to the Flatbed truck, differing only in its body colors and its modified bed design with additional fencing. Unlike the Flatbed, the Barracks OL underwent fewer modifications after GTA III, retaining its rugged, military-like design. The Barracks OL comes with three types of bed configurations: uncovered, uncovered with framing, and fully covered; GTA San Andreas' Barracks, however, features only two bed configurations: covered with tarpaulin, or covered with camouflage netting (revealing boxes on the bed). The GTA San Andreas, GTA Advance and GTA V renditions feature closed cabs, while all other renditions feature open cabs. Despite the Barracks' huge size, it only allows a driver and one passenger. From GTA Vice City onwards, Vigilante missions can be activated from the Barracks OL, but it isn't really a good choice for doing them, because the Barracks is very slow and sluggish, and it isn't too durable. In GTA San Andreas, the Barracks even features a siren without strobe lights, which, like other sirens, will force traffic in front of the truck to move out of the way. In GTA V the Barracks has four variations: exposed bed frame, painted black with exposed bed frame, partially covered bed frame, and semi-trailer. It appears with the same desert camouflage as the Crusader and Rhino. (Rear quarter view; with roof frames, uncovered). Grand Theft Auto: San Andreas (as the Barracks), featuring a tarpaulin cover. (Rear quarter view; with camouflage cover). (Rear quarter view; without roof frames). In a pre-release screenshot for Grand Theft Auto V.
Although it is one of the heaviest vehicles in the games, it is faster than the much lighter Flatbed; due to its length and its two rear axles, however, it suffers from understeer at higher speeds. Its ramming power is awesome; it can easily penetrate a SWAT roadblock. The Barracks OL has all-wheel drive, but, because of its size and weight, it can easily get stuck in off-road terrain. Despite its size, the Barracks will explode if it collides with a Rhino tank, just as other vehicles do. The Barracks OL has an average top speed but the acceleration leaves much to be desired. Boxes found on partially covered Barracks in GTA San Andreas appear to be labeled as containing ammunition, but are further labeled hilariously with warnings not to eat the boxes' contents ("Do Not Eat!"). In GTA Vice City Stories, a bulletproof Barracks OL will appear in the mission Truck Stop. It's difficult to obtain and the truck won't be bulletproof anymore once Phil Cassidy has taken control of the truck, due to the health bar. There is a visual glitch on the Barracks with the camouflage netting in the PS2 version of GTA San Andreas. If the player selects the bumper view, when looking backwards, the netting is not visible and only the bed is visible. In GTA San Andreas, if the player gains a wanted level while driving the truck, the police radio will describe the color of the truck as red. Phil Cassidy's Army Surplus, in north Rockford, Staunton Island; bulletproof during the mission "Arms Shortage." Can be obtained in the mission Sir, Yes Sir! Inside the Fort Baxter Air Base, next to the entrance. Most Barracks variations appear at or around Fort Zancudo, with the exception of the black Barracks which must be bought online at Warstock Cache and Carry. Flatbed, The civilian version of the truck. This page was last modified on 25 December 2013, at 01:31.